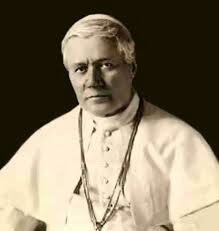 On the death of Pope Leo XIII in 1903, Cardinal Mariano Rampolla del Tindaro was the favourite for the succession. 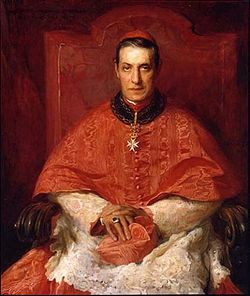 Archbishop Rafael Merry del Val y Zulueta was secretary to the conclave of 1903, after which the new Pope Pius X immediately appointed him his own personal Secretary and then Secretary of State and Prefect of the Apostolic Palace, even before he was created cardinal on November 9, 1903. The Cardinals eligible to attend the Conclave of 1903 were 64, as follows: six Cardinal-Bishops, fifty Cardinal-Priests, and eight Cardinal Deacons. 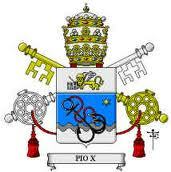 Actually the number of them that participated in the conclave of Pope Pius X were 62 cardinals since the Australian Cardinal Patrick Francis Moran, Archbishop of Sydney, 72, did not attend because of the excessive length of the journey and the Cardinal Archbishop of Palermo Michelangelo Celesia, 89 years old, was very sick. The Cardinal Archbishop of Santiago de Compostela, Martín de Herrera participated in all the sessions from his private bedroom, as he was suffering from a severe form of pulmonary emphysema. Cardinal Celesia was the oldest, but in his absence this attribute fell on Cardinal Richard de la Vergne, Archbishop of Paris, thanks to his 84 years. 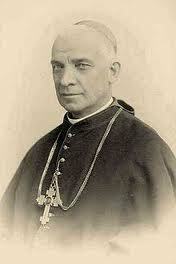 The youngest cardinal who participated in the conclave was the Archbishop of Prague, Léon Skrbenský Hriste. He was just 40 years old. 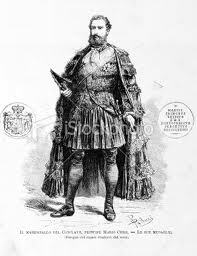 The Honorary Custodian of the Conclave and Perpetual Marshal of the Holy Roman Church was Prince Mario Chigi (1832 -1914), son of Prince Sigismondo Chigi Albani della Rovere Principe Farnese (1798 -1877) and Charlotte Amalia, Princess Colonna Barberini. The first ballot gave highly fragmented results, which were exactly as follows: Oreglia 2 votes, S. Vannutelli 4 votes, Agliardi 1 vote, Capecelatro 2 votes, Rampolla del Tindaro 24 votes, Di Pietro 2 votes, Sarto 5 votes, Gotti 17 votes, Ferrata 1 vote, Cassetta 1 vote, Portanova 1 vote, Richelmy 1 vote and Segna 1 vote. In fact, at the end of the first day of voting, the prevailing view was that Cardinal Rampolla del Tindaro was quickly climbing the ladder that would lead him to the "throne of Peter." The Sicilian cardinal , after the second ballot held in afternoon, received almost half of the votes. 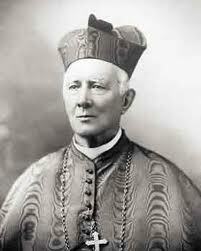 He had won the preference of 29 cardinals out of 62. In the meantime Cardinal Sarto improved his position and his tally rose to 10 votes, while Cardinal Gotti's position remained unchanged with his 17 votes . 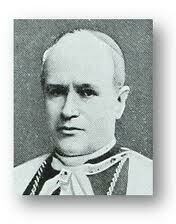 On the evening of Friday, July 31, 1903, Cardinal Jan Puzyna de Kosielsko, was visibly agitated, and restless wandering in the halls of the Apostolic Palace. 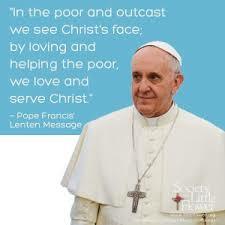 Whenever he met some prelate he took him by his arm and strongly said to him: "Please! Please! 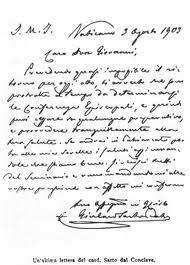 Let us have a good Pope"
The veto in the name of the Austrian Emperor should have been pronounced by the Cardinal Archbishop of Vienna Josef Gruscha, but the cardinal refused for reasons of principle and for the friendship that bound him to Rampolla del Tindaro. 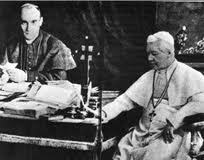 It was then, on the 2nd August , that Cardinal Puzyna , Metropolitan Archbishop of Krakow imposed the veto of Emperor Franz Joseph of Austria against Cardinal Rampolla, as he discreetly announced before the opening of the conclave itself. Just as the second day of the balloting was opening, Cardinal Puzyna rose from his throne and read a script previously drafted, and declared that the Emperor of Austria and Hungary, Franz Joseph, was using his ancient privilege, to put the veto on the election of Cardinal Rampolla . The Austrian-Hungarian empire was, in fact, one of the three Catholic nations who enjoyed the privilege of so-called ius exclusivae. 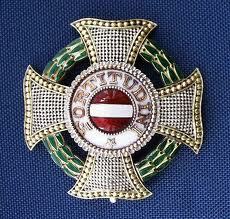 Cardinal Puzyna was later rewarded with the highest Austro-Hungarian decoration the Grand-Cross of State. This is the translation of the Austrian veto: "I do honour, having been called to this office by the highest order, do humbly pray Your Eminence, as Dean of the Sacred College of Cardinals of the Holy Roman Church and Chamberlain of Holy Roman Church, to know and note for your own information and to notify and declare officially, in the name and by the authority of His Apostolic Majesty Franz Joseph, Emperor of Austria and King of Hungary, his Majesty, wishing to use an ancient privilege, imposing the veto of exclusion against ' His Eminence Cardinal Mariano Rampolla del Tindaro. " Rampolla responded this way: «Vehementer doleo gravi vulnere illato Ecclesiae libertati. ; autem quod ad me attinet, nihil gratìus, nihil poterat accidere jucundius». The Secretary of State in fact, replied with dignity at this incredible interference, thanking the Lord for having subtracted the weight of the papacy, while, if his brother cardinals had intended to elect him, declared himself saddened by the serious attack on freedom of the Church. Leo XII policy of reconciliation between France and Austria, endorsed by Rampolla, exposed him to the suspicion of being philoFrench in the eyes of the Austrians. 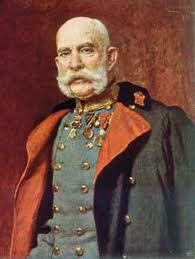 - Austria asserted that the opposition was motivated for Rampolla's membership in the Order of the Templars. 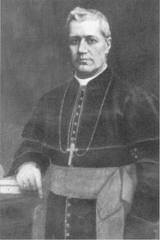 It did not seem, however, that the Polish prelate's interference had immediately affected the vote of the Sacred College. The outcome of the vote in the afternoon of Sunday, August 2, was characterized by not deviating much from the previous ballot result, perhaps because a part of the Cardinals had not intended to respect this imperial interference, but the designation of the new pope was restricted in practice to two main candidates. Cardinal Rampolla had taken, in fact, one more vote (29 to 30), Sarto won 3 more votes (21 to 24), while Gotti collapsed from 9 to 3 votes. Then came the third day, the day when it was thought that the Austrian veto would produce its effects. 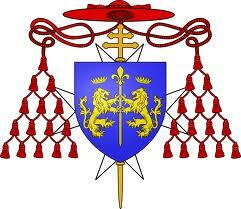 It transpired that the cardinals were afraid of losing the support of the strongest European Catholic monarchy. After the fifth ballot, the situation started to change. Rampolla in fact descended from 30 to 24 votes, Sarto again gained more votes, from 24 to 27, as well as Gotti, who went up again from 3 to 9 votes. 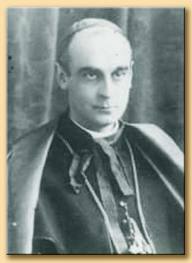 On the evening of August 2, 1903 the Patriarch of Venice, Giuseppe Melchiorre Sarto gained 30 votes against 21 that went to Rampolla. The outcome of that vote, had driven the Patriarch of Venice Cardinal Sarto to speak to his confreres: "... to pray and to ask them to forget his name, adding that he "ex conscientia sua", he did not feel worthy to ascend to the throne of Peter. " Rampolla's supporters were not able in the short time then available to transfer their combined support to another prelate. 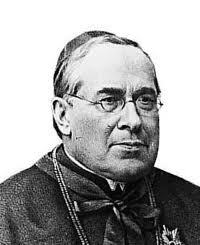 On August 4, 1903 the Patriarch of Venice Giuseppe Melchiorre Sarto was elected with 50 votes of the 62 cardinals cloistered in the conclave and took the name of Pius X. The first act of the new pope, however, was to abolish the use of the veto forever, by means of the Apostolic Constitution "Commissum Nobis."